"Hurry, get in the car! Timmy fell down the well at the old farm! I'm driving!" Headline: Collie gets collared by a copper! "Timmy, go stand where I can see you while I back up the car. 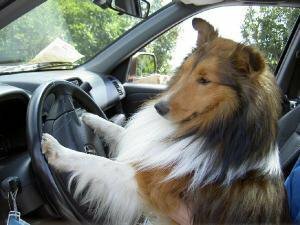 You know how accident-prone you are," Lassie said. Timmy, stunned that his dog could both talk and drive, went mutely to stand on the porch. GPS? Who needs GPS? I can smell my way there. Lassie demands everyone leave before the disaster strikes. Ack! The car ate the dog! That's what it gets for chasing it. Yes, it's true I can only recognize red lights by position, but I bet you can't smell the oil level.